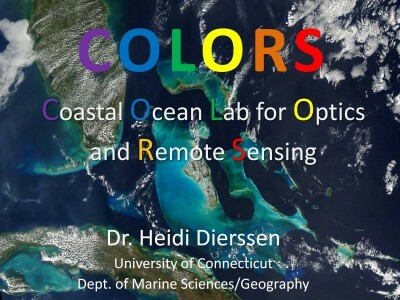 WELCOME to the Coastal Ocean Laboratory for Optics and Remote Sensing (COLORS) led by Dr. Heidi Dierssen, Professor in Marine Sciences and Geography, at the University of Connecticut. The lab is located at the scenic marine campus of UCONN Avery Point in Groton CT.
Our current projects involve optics and remote sensing of the coastal zone throughout the world ocean. We are primarily involved in hyperspectral imaging with airborne and in-water sensors to study the optics of coastal habitats and organisms at a variety of space and time scales. Our laboratory has a variety of imagers, spectroradiometers and other instruments to measure the optical and physical properties of the water column that can be loaned out to students or investigators. Come visit us in the Marine Sciences Building at the Avery Point Campus! Also please visit our youtube website for more videos from field studies.